An official press release will hopefully be ready soon. I will also post updates as more information becomes available. John "Courage" Philpott sends us a picture from the Rhino Bugaloo interview and voice over, etc. (bonus materials for the DVD), which took place at Goldcrest Post Productions in London, on November 17th, 2005. 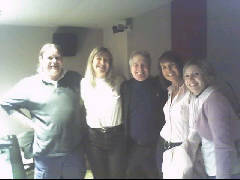 Pictured from left to right: Andy sound technician, Ethel Davies Interviewer, JohnP, Caroline and Sasha. This picture was taken with Little John's phone camera. Thanks John, it is much appreciated!! 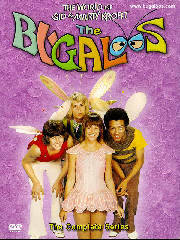 The episodes included are "Firefly, Light My Fire", "Courage, Come Home" and "The Uptown 500". 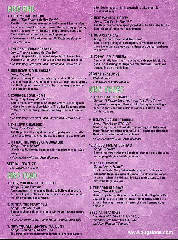 Note that this sampler DVD lists "The Uptown 500" as episode #11. This is because that was the 11th episode according to the original air dates. The production number for that episode is #16, which is how I have it listed on this site. 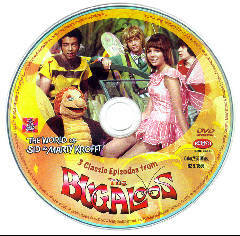 Since most releases of the Bugaloos have been according to production number, the actual Bugaloos DVD Box set will use the production number ordering. 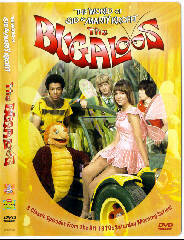 The latest word from Rhino Home Video is that the Bugaloos DVD Box Set is scheduled for release on May 23rd, 2006. That's all the news I have for the moment. I will post the official press release when it is ready. The Bugaloos DVD release is starting to ramp up!! 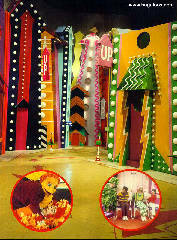 On May 22, in NYC, the Makor (part of the 92nd St. Y) will present an evening with Sid & Marty Krofft. It will be a moderated event, with clips and Q&A, to help launch The Bugaloos box set. Wish I could go, it sounds like fun. If I can obtain pictures from the event, I will post them. If you plan to go, let me know. If you look closely at the back cover, you will find a "Thank You" to both Sandy and myself. Props to Rhino for being big enough to put together a project of this magnitude, and yet be cool enough to still remember the "little people". My thanks to them for listening to the fans, and letting us be a part of this effort. Note: If you are having trouble reading the disc contents or the text on the back cover, you may click on those again for an even larger image. I will say that I think Rhino has done a wonderful job here, and that it is really great to finally have this series in DVD format. I wish I could answer more questions about the contents of the discs, but I think it is only fair to leave a little mystery, and let Rhino present things to you as they would. of brothers Sid & Marty Krofft. Lidsville, Sigmund and the Sea Monsters and more! Marty will sign autographs and chat about the shows you grew up with. So come and enjoy Saturday morning, 70's style! "We�ll be giving away the kind of prizes any Krofft fan would drool over, too: an H.R. Pufnstuf box set, a Sigmund and the Sea Monsters box set, a Lidsville box set and a Land of the Lost box set. The Land of the Lost set alone retails for $99.95. 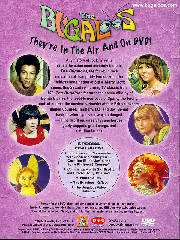 Come armed with esoteric Krofft knowledge next Monday if you want to bring home some free DVDs." You also get treated to a video clip of the Sigmund and the Sea Monsters theme song. Hopefully they'll get a Bugaloos clip up there, soon!! Nice to know the Kroffts and the Bugaloos can still pack 'em in! !